Mrs. S. Amudhavalli, Chief Educational Officer, Cuddalore District, Tamil Nadu complimented the work of Indian Development Foundation in the areas of health, education and rural development. The C.E.O. also congratulated school-team of Rani Seethai Achi Hr. Sec. 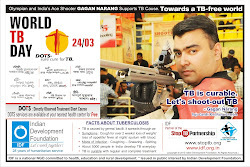 School, Chidambaram for lending excellent support to IDF in its leprosy and tuberculosis awareness programme. The support extended by the students of Rani Seethai Achi Hr. Sec. 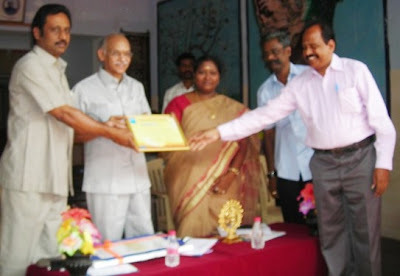 School need to be written in the letters of gold, expressed Mrs. Amudhavalli. Mr. M. Rathina Sabhapathi, Registrar of Annamalai University - Mr. R. Dharbarayan, Headmaster of the School and Mr. Aser Ravichandran, P.T.A. President expressed their happiness in extending continued support to the humanitarian programmes of the Foundation. Mr. C. Chidambaram, Manager-SR, IDF thanked the school-team for creating massive awareness programmes and mobilising voluntary resources for the cause. IDF young ambassador Shiloh Jessie Francisca, student of Rani Seethai Achi School, felt proud of being associated with the Foundation in promoting social programmes in Tamil Nadu. Young students should come forward and support noble causes. Students are the changemakers in the society and we should learn social values at young age, said young Shiloh as she received honours for her social responsibility. IDF congratulates its young social ambassador Shiloh Jessie Francisca for extending all support to the Foundation. IDF also record its appreciation to the school-team for its continued support. Advait Nambiar, Riddhi Shah, Priyanka Shah, Preyas Trivedi, Anis Mandlekar, Dharam Jhaveri and Nainesh Monpara from Nanavati School, Vile Parle (W), Mumbai visited IDF office on 20th Feb.2010 as part of their social project visit. The students interviewed Dr.Narayan Iyer, national co-ordinator of the Foundation and collected information on leprosy, tuberculosis and other social projects of IDF. The students were impressed by the work of IDF and recalled with pleasure their participation in leprosy programmes of the Foundation a couple of years ago. We are indeed happy to visit the NGO which we had supported a few years ago and see for ourselves the good work being carried. We are glad to learn about role of young social ambassadors of the Foundation and we wish to be a part of it in the coming days. IDF really made our day, said the young bubbling students with a great smile. ITM Business School, Kharghar invited various NGOs for the presentation session organised by the ITM students for their social responsibility internship with various organisations in India. IDF team Dr.Narayan B. Iyer and Mr. Karthick S., called on the Badminton Legend Mr. Prakash Padukone at Khar Gymkhana on 13th Feb 2010 and presented IDF literatures and the latest book `Hope on the Horizon. Mr. Prakash Padukone appreciated the work of Indian Development Foundation in nation building activities. R.S.K. Hr. Sec. School, Kailasapuram, B.H.E.L. Township, Tiruchirapalli bagged all India top performers list in rendering excellent social responsibility supporting leprosy/ TB programmes of Indian Development Foundation (IDF). R.S.K. 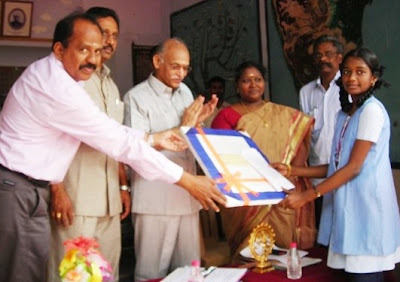 School is the recipient of Mother Teresa Memorial Award for excellent social work during 2001-02. The history is repeated again and our students are committed to social causes, said Mr. P. Varadarajan, Principal of the School. A prize distribution programme was organised on 11th Feb. 2010 at the school campus to honour the students for their excellent social support. Mr. J.C. Christopher Rajkumar, Addl. General Manager (Informatics Centre) congratulated RSK team for keeping up the tempo of social work and lending splendid support to various noble programmes. IDF Team comprising Dr. Narayan B. Iyer, Mr. C. Chidambaram, Mr. R. Settu and Mr. Sam Deva Asir RM visted the school to express sincere gratitude to all the students for joining hands with IDF and responding positively to the social call. Bharat Heavy Electricals Ltd. (BHEL) supports IDF's health, education and rural development programmes. The educational institutions in the BHEL Township have been participating in leprosy/ TB awareness programmes for nearly 2 decades now. IDF thank the school-teams for their excellent social responsibility programmes. Shri N. Sugalchand Jain, Managing Trustee, Bhagwan Mahaveer Foundation, Chennai appreciated Indian Development Foundation's health, education and rural development work. Dr. Narayan B. Iyer and Mr. C. Chidambaram called on Shri Sugalchand Jain and handed over a copy of the book Hope on the Horizon. 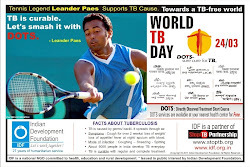 St. Michael High School, Gedalahalli, Bangalore supports IDF's leprosy/ TB programmes. Top performing students from St. Michael School presenting donation to Mr. Samuel Vincent, Development Executive, Indian Development Foundation. IDF thank St. Michael school-team for their generous support !!! Dr.C.N.N.Nair, Treasurer-Trustee of Indian Development Foundation presented certificate of appreciation to the students of ITM Business School - Tejpreet, Pallavi, Neha, Biswaranjita, Karan and Dattsen - for their social internship with the Foundation. Congratulations to ITM team for the excellent social responsibility. Mr. M. L. Sharma, Principal, Tagore Vidya Bhavan, Swarnapath, Jaipur. IDF thank Tagore Group of Schools for their continued support to leprosy eradication programmes in Rajasthan. Tiny Tots Secondary School, Lal Kothi Scheme, Jaipur joined hands with IDF in the leprosy/ TB awareness programme. The students created awareness among the family members and neighbours and also brought support for the cause, Dr. Sarita Khanna, Principal of Tiny Tots said. Our students participate in various social programmes of IDF and other NGOs and lend support from time to time, she added. Dr. Narayan B. Iyer from IDF congratulated the efforts of the Tiny Tots in supporting social programmes and appreciated their concern for the society. NSS volunteers from Mody Institute of Technology and Science (MITS), Lakshmangarh, Sikar had an interaction with Dr. Narayan B. Iyer, national co-ordinator of IDF. Dr. Narayan talked to NSS volunteers and the faculty members of MITS on scientific information of leprosy on 3rd Feb. The students appreciated the work of IDF and volunteered to participate in the national programme being its social ambassadors. We are moved by the social programmes organised by IDF and we wish to be a part of it by being its social ambassadors and carry on the message to the masses, said Neha and Ghazal. Dr. Shakti Baijal, Dean of MITS, Faculty of Arts, Commerce and Science congratulated the efforts of IDF in leprosy elimination programme. The awareness talk was organised as a part of Anti-leprosy week observance - (30th Jan to 5th Feb). Mrs. Niti Mahendra, Principal, Bharatiya Vidya Bhavan's Vidyashram, Jaipur congratulated the efforts of Indian Development Foundation in the areas of leprosy eradication programme. Bhavan's Vidyashram has been a constant supporter of IDF's humanitarian programmes for several years now. Dr. Narayan B. Iyer thanked Bhavanites for extending full support and co-operation for leprosy/ TB programmes. Dr. Narayan B. Iyer presenting a copy of `Hope on the Horizon' to Mrs. Niti Mahendra, Principal, Vidyashram. Rajkiya Schools in Jaipur continuously participate in leprosy/ TB awareness programmes and spread health message to the masses. 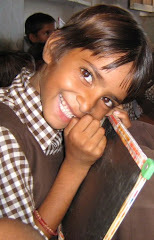 IDF thank Rajkiya Schoolteams for all their benevolent support. Mrs. Archana Sharma, Principal and Mrs. Rekha Tiwari, Social Service Incharge Teacher from Rajkiya Maharaja Balika Sr. Sec. School, Chhoti Chaupad, Jaipur along with their team presenting voluntary donation for leprosy/ TB cause to Dr.Narayan Iyer, IDF. 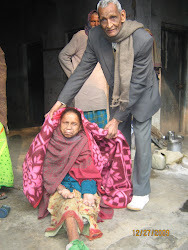 Mrs. Anu Choudhary, Social Service Incharge of Rajkiya Maharaja Balika Sr. Sec. School, Chhoti Chaupad, Jaipur presenting voluntary donation for leprosy/ TB cause to Dr. Narayan Iyer. Mrs. Gayatri Arya, Mrs. Harsha Vyas, Mrs. Arvind and Mrs. Nishya Arya from Rajkiya Adarsha Balika Sr. Sec. School, Gangori Bazar, Jaipur presenting support to IDF's humanitarian programmes.